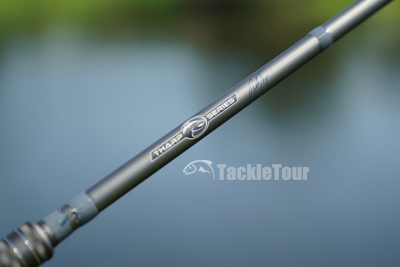 Introduction: Ark Fishing Rods has risen to the top of consciousness amongst value minded anglers seeking good, solid performing product at a price point that won't break their tackle budget. 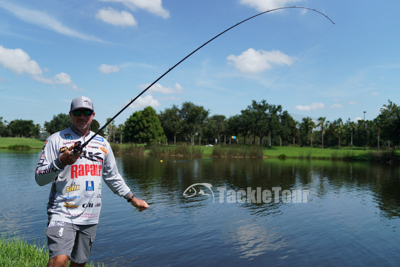 The company continues that trend this year with their new signature Randall Tharp Series of rods. Of course Ark had something up their collective sleeves this year. Introducing the Tharp signature Series. Ark Tharp Series: Randall Tharp is a self proclaimed flipping addict, but of course, as with any pro on the Elite tour, flipping is not his only strong suit. 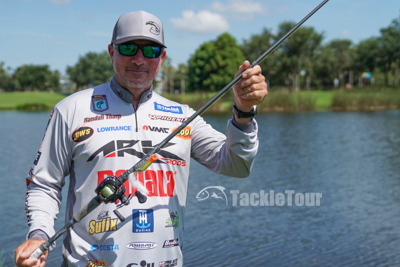 Every angler on the tour must be adept at a variety of techniques and Ark Rods leveraged Tharp's experience and knowledge in the design and build of this new series. They worked hand in hand to tailor each stick to the taper, balance, and sensitivity that Tharp specified. Randall Tharp himself was on hand the day before ICAST to give us a demonstration on the water. There are 12 rods in the entire series. There are 12 rods in the entire series, ten casting and two spinning. 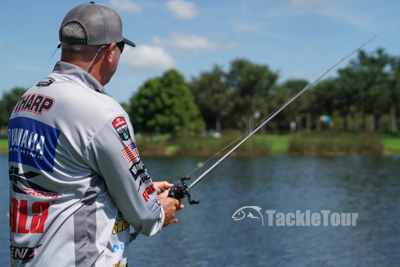 While few Elite pros will admit to using them, spinning rods are still an essential tool in every bass angler's arsenal and of course, the two rods in this series are tailored for finesse and other light line techniques. 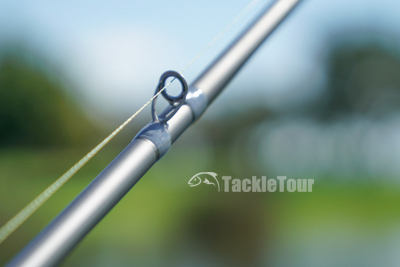 The casting rods on the other hand cover everything from Tharp's favorite technique, flipping and pitching, to moving bait applications. 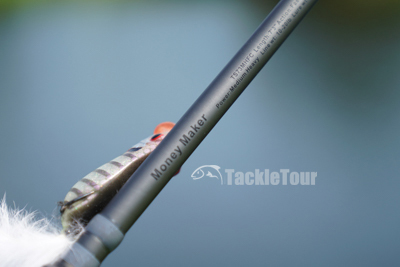 In fact, there are three cranking sticks in the lineup from 7'-0" to 7'-10" in length and another 6'-9" stick that looks very well suited for spinnerbaits and jerkbaits. Each features this all grey motif. Fuji K-Series guides with F-ring inserts. 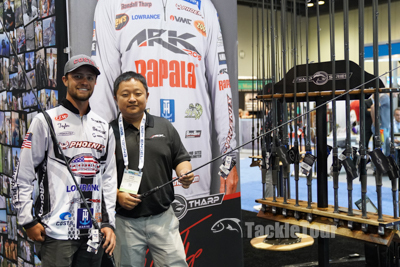 We were able to preview the sticks during ICAST's on the water event the day before the official opening of the show. Tharp was particularly proud of the TS73MHFC code named, Money Maker. With a name like that, we can see why it's his favorite. The TS73MHFC is Tharp's favorite in the lineup and with a code name of "Money Maker" we can understand why. Tharp trying his hand at a classic TT pose. 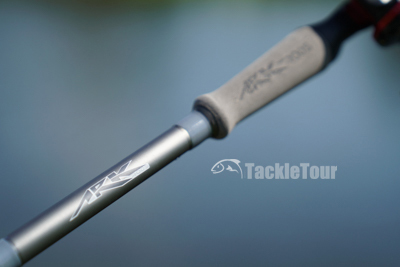 Louie Zhang, president and CEO of Ark Rods tells us every rod in the series aside from the cranking sticks are built from blanks rolled with Toray 40 ton graphite. This is among the highest grade graphite available in the market today. The kicker with these sticks? They retail for only $129.95. The cranking sticks (last three in the matrix above) are composite blends, otherwise every rod in the series is finished with a graphite reel seat for sensitivity, high density EVA grips for comfort, and Fuji K-Concept guides with F-Ring inserts. We gave Louie Zhang, president and CEO of ARK, a list of rods we think deserve a closer look back at TT HQ, so stay tuned for more. The kicker, as with every series Ark offers is the retail price. Each stick in Tharp's signature Series will retail for just $129.95. 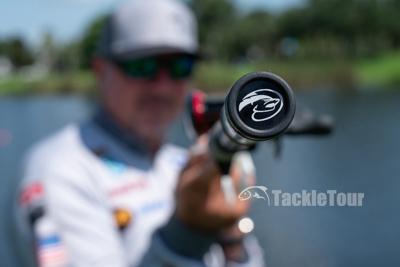 We gave Zhang a list of rods we think deserve a closer look back at TT HQ and on Zander's boat so stay tuned for more on this series in the coming months.